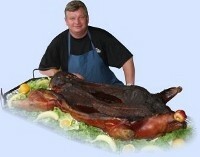 Welcome to Pro Barbeque's online home for food service packages and "Real Texas Taste"! Click on the buttons to the left to learn more about our packages. The term "professional" is taken very seriously at Pro Barbeque. From our competition calibre chefs to our delectable meals, you can be assured of a memorable experience with every bite. We insist on providing the highest quality meals, made from only the finest ingredients. Our chefs continue to strive for perfection while following the newest taste trends. The result is succulent first class meals, delivered without hassle and enjoyed in a relaxed atmosphere. With every meal we serve, our list of satisfied customers continues to grow. Pro Barbeque - known by reputation, renowned by taste!